He’s just a likable, plain spoken Midwestern mayor who happens to be about everything that Donald Trump isn’t. 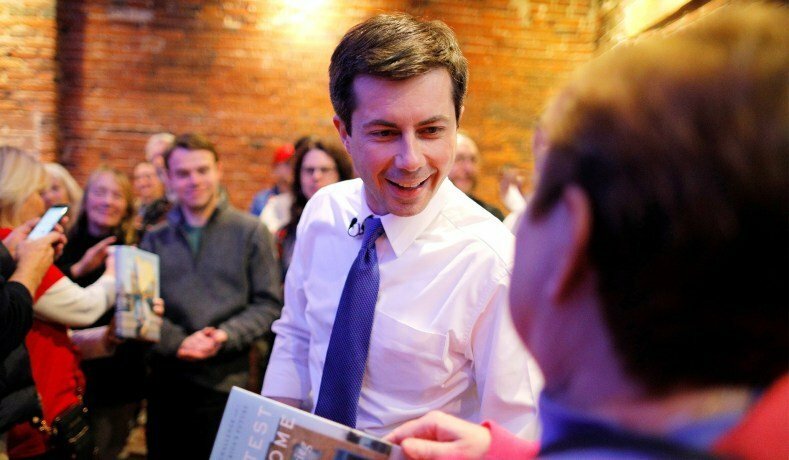 Now, South Bend mayor Pete Buttigieg has surged to third place in a new Iowa poll, making strides in a crowded field in the key caucus state. The 37-year-old Iraq and Afghanistan vet jumped to earn 11 percent support in the latest Emerson poll of Democratic presidential candidates in Iowa. He trailed two vastly better known candidates: former Vice President Joe Biden, who hasn’t yet entered the race, and Vermont Sen. Bernie Sanders. Back in January, Buttigieg didn’t even register in the poll, scoring 0 percent. California Sen. Kamala Harris, who was at 18 percent in January, saw her support drop to 10 percent in the latest Emerson poll. Spencer Kimball, who directed the poll, called the showing by the politician who goes by “Mayor Pete” was the biggest surprise in the survey. “Last week we saw him inching up in our national poll, and now he’s in double digits in Iowa, America is going to be asking who is ‘Mayor Pete’?” he said.